25 Days of DIY Gifts Peppermint Sugar Scrub in a Jar with FREE Printable Tag. If you are looking to save some cash from your budget this holiday season, stop by Cincyshopper each day for my 25 Days of DIY Gifts. I am looking forward to sharing 25 Plus Do it yourself Gifts for all of you to consider gifting to your friends and family . These gifts will be inexpensive simple gifts that you can put together yourself. These will range from food, health & beauty, Dollar Store Gift Ideas and much more. Many will include items that we can gather with coupons too! So get ready to have some fun making up some unique and personalized gifts. 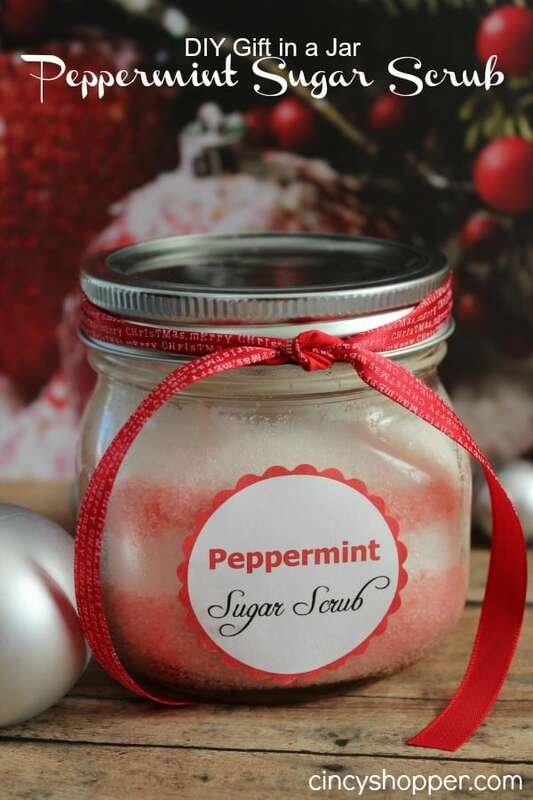 Day 1- My first DIY Gift for you to consider is my favorite DIY Gift in a Jar Peppermint Sugar Scrub. If you have a Bath & Body lover on your shopping list, this one is perfect. I decided to whip up this Peppermint Scrub Recipe and toss it in an inexpensive Mason Jar, wrap it with a bow and I even made up this cute and simple Printable Label to offer you to print. This DIY Gift in a Jar Peppermint Sugar Scrub is to die for. This scrub works for so many different things. I personally love scrubs and exfoliating. Peppermint extract, which is in this scrub, is good for your skin because it keeps feeling fresh, moisturized, and free of any type of pimples, or blemishes. Peppermint is said to be huge stress reliever (anything that relieves stress, I am willing to try, ha ha). So if you take a shower and scrub yourself with this, I promise you will begin to fell the stress pour out of you and you will find yourself feeling so relaxed. Peppermint is also great for headaches. So once again, showering with this will help your headache extremely. With the combination of the soothing peppermint extract from the scrub and the heat from your shower, you can say bye bye to your headache. Another benefit of this scrub would be if you are sick and stuffed up sinus, showering with this and the combination of the heat should open up your sinuses and allow you to breathe. This Peppermint Sugar Scrub is a serious must have this winter season and will make for a perfect gift for another or maybe yourself, ha ha. Make a large batch, package it and give it to all your girlfriends this Holiday Season! They’ll thank you for it, trust me, ha ha! 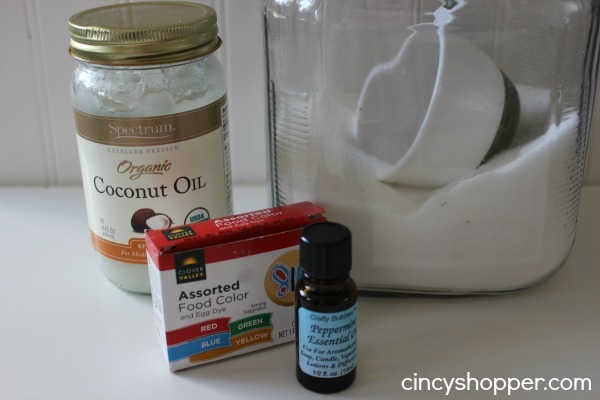 I never realized how easy it is to make your own Sugar Scrubs. I picked up a jar of coconut oil at Remke last week for around $8.00 This one bottle has already made around 8 mason jars of scrubs. I still have about 1/4 bottle left to use. Not bad pricing at all. Grab your Mason Jars at Remke too if you are a Remke shopper, I think their pricing is quite competitive on Ball Mason Jars. Also, drop in Target (a wide selection) or also the Dollar Tree (just $1 each for an off brand). Peppermint Essentials Oil (found near Candle Making Supplies at Hobby Lobby or Online). I think you could also use Peppermint extract too! 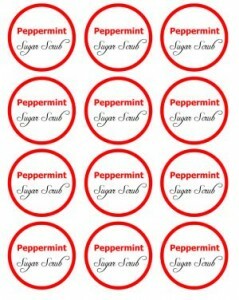 Ribbon and Printable Peppermint Sugar Scrub Label if you care to make this gift even more personal. No reason to spend a fortune to give those special peeps in your life nice gifts. So drop back by each and every day and see if one of my ideas would be perfect for that someone on your shopping lists. Have a DIY Gift you would like to share? Please leave us your idea in the comments. If you should decide to whip up one of my gift ideas leave a comment letting us know how it turned out for you. If you are needing other DIY Gift Ideas be sure to drop by Cincyshopper each and everyday for my 25 Days of DIY Gifts Series. I have already shared DIY Coffee Scrub, DIY Sugar Cookie Scrub, Lavender Body Butter, Lemon Sugar Scrub, Cranberry White Chocolate Oatmeal Cookie Mix in a Jar Gift a White Chocolate Covered Pretzels Jar Gift, a Salted Caramel DIY Gift, a DIY Pork Rub in a Jar for the Men, A DIY CopyCat Montgomery Inn BBQ Sauce for the Men, Rudolph Hot Chocolates, DIY Christmas Play Dough for the kiddos, Hershey’s Kiss Jar Gift , Rudolph 6 Rootbeer 6 Pack for just about anyone (we are giving them for teacher gifts). I will be offering up some ideas for DIY Gifts for everyone on your shopping lists. you can check out all my ideas so far here. Also, be sure to follow my DIY Gifts Board on Pinterest! Hi Sherry! I picked my coconut oil at Remke for this batch and it was quite liquified so I did not have to make it liquid form. I would suggest heating yours up (I noticed my one I bought at Walmart was rock hard). It should only take just a few seconds for it to melt. Hope that helps. Glad you are making this one, it has been my daughters favorite (she had an early gift, lol). Hi Casey! This recipe will make a 16 oz sized mason jar. Hope that helps. Thanks Much and Merry Christmas! My coconut oil says that its cooking oil … is that right?! Hi Amber! You have the right stuff! Good for baking and cooking. But can also be used for body care. Glad you are whipping up a batch. Merry Christmas to you! Whipped up some for all the ladies in my family and made some for myself and used it already! It is wonderful … thank you!! What happens with the food coloring? Does it make your skin colored when it gets wet? Hi Danielle! My daughter has had no issues with the food coloring being any issue. I think because it is so light and gets mixed in. I took a whole scoop of the pink and scrubbed in between my hands and had no issues of discoloration. Hope you have a wonderful holiday! Hi Meslissa! You should be fine making in advance. I made this back in mid November and my daughter has been using it almost daily. If it gets a bit dry you can just ad a couple drop of water. But, she has had no issues with it for the past month. I guess it should be obvious, but are their directions for how to use it? Hi Michele! This scrub is great for just about any area of the body. You can use it on your hands, face, etc. Or use while showering. I hope that helps and Merry Christmas. I made this yesterday. It smells wonderful! My husband, daughter, and I tried it out and it made our hands super soft! 8 gifts made! Thank you for sharing your recipe! These turned out great. Several of my girlfriends and I made them together during our annual holiday get together. Thanks for sharing! If you use coconut oil does it need to be melted before you mix it with the sugar? Is coconut oil better than almond oil? Hi, could I use olive oil ?? How long would this last? I’d love to make a few for gifts but want to know if there’s an “expiration date”. Thanks. I made something like this a few months ago, but realized that coconut oil can clog drain pipes if you use it often. I would recommend sweet almond oil, since it doesn’t solidify, but is still great for your skin! Could you let me know how long this lasts? How long does it last? I am making these scrubs for craft fairs and would like to know the expiration dates. I made this last night with the coconut oil (which was solid as a rock when i purchased it) and now the scrub is a solid mass as well. What can I add to the mixture to make it into a more liquid form? I had the same problem. But if you add a little bit of olive oil to the melted coconut oil, it won’t solidify again at room temp. I could find mason jars that are really inexpensive. I am ten and I feel like these sugar scrubs will make a perfect gift. I want to make it for my sister but she is allergic to cocnut.